Édgar Ramírez has been an actor on the rise for the past seven years, after he first came into prominence playing the deadly and mysterious Paz in The Bourne Ultimatum. Following roles in Vantage Point and Che (Part 1), the Venezuelan-born actor delivered a breakthrough performance in the mini-series Carlos, which lead to roles in Wrath of the Titans, Zero Dark Thirty, The Counselor and Deliver Us from Evil. The actor takes on a character close to his heart in the fascinating indie drama The Liberator, where he plays the historic figure Simon Bolivar, who became a legend by literally liberating South American countries such as Peru, Panama, Northern Brazil, Panama, Ecuador, Colombia and the actor's home country of Venezuela. I had the chance to speak with the actor earlier this summer about The Liberator, which hits theaters on October 3. Here's what he had to say below. I have to say, this was quite a phenomenal story. I was really blown away by it. Édgar Ramírez: Oh, thank you, great to hear. Thank you so much. As a native of Caracas, how important was his story to you, growing up? His story has been told before on the big screen, but it's been several years and it hasn't really been told with this sort of a scope before. Do you think this was the right time to shine a light on his story and this period in history? Édgar Ramírez: Yeah, I think that (Simon) Bolviar's saga was always going to be a subject of moviemaking, always. It is definitely a fascinating period of history, and it's definitely a fascinating life. We could do a thousand movies about Bolivar. The events that took place during his life and his experiences are pure material. I think there are a lot of movies to be made about Bolivar. I'm very happy to be a part of this endeavor, especially growing up being surrounded by Bolivar's legacy. His portraits were in every school I went to, and in every government office that you would go to. There's a square named after Bolivar in every town, every village, not only in Venezuela, but in every Latin American country that he helped to liberate. Airports, universities, orchestras, bear his name. He was very ominpresent in Venezuela and in most South American countries. It was a huge privilege and an enormous honor to portray this character. I read that (director) Alberto (Arvelo Mendoza) and the producers wanted a writer who hadn't grown up with Simon's story, which lead to (screenwriter) Timothy J. Sexton writing the script. Do you think that was important to get a fresh prospective on the story? Édgar Ramírez: Absolutely. I'm very happy that you bring that up, because, in all of the interviews I've had, nobody has brought that up. I thought that it was a very smart and sensitive decision to give this story to someone who would have enough experience in Latin America to understand our culture, but, at the same time, enough personal distance in order to also identify subtleties within the story, because, Bolivar is too close to us. He's all over, you know. It's very difficult to distance yourself from someone whose stories and myths and legends have been a part of your collective imagery since you were a kid. It was fantastic to have someone as sensitive and as close to Latin America, but also, as distant enough to find the complexity in this character. Since you were so familiar with the story, when you were revisiting it now, were there any aspects of his life or of what he accomplished, that you weren't as familiar with, or were surprising to you? Édgar Ramírez: I think that... there were playful aspects of his personality, like, for example, Bolivar being a very good dancer. That, I didn't know, that he was considered a great dancer. That he really enjoyed it and he would bring his music notes everywhere he went, and handed them out to local musicians, in order to be surrounded by music. That is the reason why the music is such an important aspect and element of the movie. Of course, we had the privilege to have Gustavo Dudamel composing the music, because it was a very important part of his life. Actually, we also discovered that he was more sophisticated than we were taught he was. He had a very sophisticated, cultural life. His mother was very active in the arts, in Caracas, and the city itself was very culturally dynamic. Bolivar himself was a part of that. No wonder he spent so much time in Lima, Peru, it was such a big metropolis of the Spanish Empire, at the time. He spent a lot of time there because it was a city that had a lot to offer for his taste. Of course, it was surprising to learn that, someone with such a sophisticated education, which was a consequence of his social stature, that someone like that would have such a popular connection, such a deep connection to people from lesser privilege. He had such a deep understanding of their necessities and their needs for education and social change. That as also something that was very surprising. He could have just been a rich kid, as he was, and just take part in the spirit of the time, and try to fight for independence, as many did at the time, here in the U.S. and across the continent, but his ideas of democracy and liberty, as we point out in the movie, include all man, from different races and social statuses. That was a pretty revolutionary take on the struggle for independence that wasn't taken into consideration. I was also curious about his death. It seems the "official" cause of death was tuberculosis, but this film paints a very different picture. I'm curious about how that was approached, and how much knowledge there really is out there, about what really happened? Édgar Ramírez: Well, Tim decided to have a more climactic ending, leaving it open, you know. He thought an ending like that, as I told you before, to be more climatic, more in tune with the third act of the movie, that has a lot more to do with the political thriller. It was a choice that he took to bring it to the point where, whatever speculation around his death could take place, without completely twisting the official history about it. I thought it was very interesting, in dramatic terms. Can you talk a bit about your work with (director) Alberto Arvelo Mendoza, his style on the set, and how his work may be set apart from anyone else you've worked with? Édgar Ramírez: Well, he's very steady. He has a very high sense of composition. He majored in history and art, and he comes from a lineage of famous poets and writers in Venezuela. His father and brother and his grandfather and his great-great-grandfather were renowned writers, philosophers and poets in the country. He's a very smart guy and very cultivated. He has a very high sense of aesthetics and composition. He set the tone for this movie. He wanted to, basically, allow the audience to go back in time and experience what life in 19th Century Latin America could have been. At the same time, he wanted to do it in a way that would be far away from the paintings and the museums. It's very intriguing. It's very delicate. It's a very thin line from being cartoon-y and being almost square. Normally, the documents you have available to you are letters and statements. Nobody speaks in the way they write, you know? You don't speak in the way you write an article. So, there's a very thin line, but, at the same time, we didn't want to break the illusion of being in the cast. Not only the actors, in the way we spoke, the tone, mannerisms, but also the production design and the costume design, we wanted the movie to feel real, to feel alive, to not feel like you're watching a moving painting, a moving painting. That was very important to give a sense of reality, passion, sexiness. We wanted the movie to nreathe and to sweat and to feel real. That's all Alberto's responsibility. He was very keen in trying to achieve that quality. I was wondering if there's anything you can tell us about the Point Break remake? I know a lot of people are very excited about that, and we've heard that it's set in the extreme sports world. Is there anything you can say about this new version of Bohdi, and what sports he's in to? 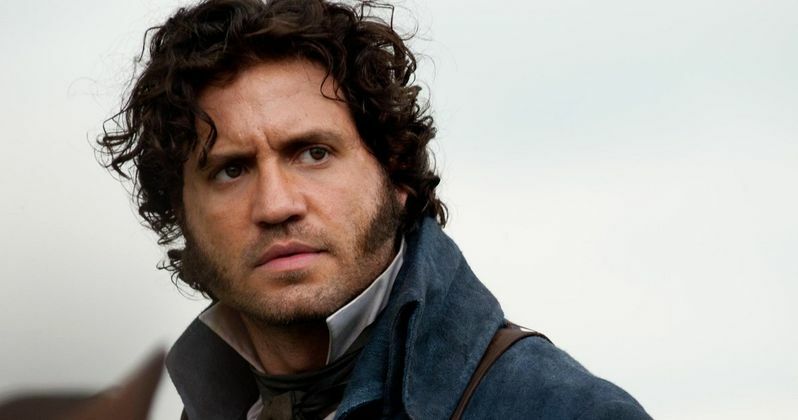 Édgar Ramírez: I'm very excited to be playing this character. I will start in three weeks, principal photography (Note: this interview was conducted in June 2014). It's been a teenage fantasy of mine to play Bodhi. It's one of my favorite movies and I'm a huge fan. I remember when I first met Kathryn Bigelow, the first thing I said to her when we were discussing Zero Dark Thirty, was how much I loved that movie, and what a huge influence that movie had on my generation and on me. I couldn't be happier, to be a part of this remake. Actually, the only remake I wanted to be a part of was precisely Point Break. It's more than just an opportunity to me, it's a dream come true, to be a part of this. It is a different story. There's no point in remaking the first movie. What we are trying to keep is its rebellious, subversive, anti-system spirit. That is definitely the essence of the first movie that we want to keep alive on this one, and it's definitely a movie on a different scale. It's a global movie, with actors from all over the world. Of course, I'm playing Bodhi. Édgar Ramírez is playing Bodhi, and that can tell you already that this movie is trying to reimagine the spirit of the first one. What can I tell you about Bodhi? I can't tell you much now, but I'm very excited. I'm a huge fan, and I definitely want to protect the legacy of the first movie, and I think that many people are in for a big surprise. I was also wondering if there's anything you can say about Hands of Stone? I'm a big fight fan, so I was curious about what stepping into the shoes of Roberto Durán was like? Édgar Ramírez: Imagine stepping into the shoes of Roberto Durán, one of the most legendary boxers in the history of the sport, and definitely the most legendary Latin American boxer, and then having Raging Bull in my corner. I mean, imagine that? Just having Robert De Niro to play the trainer in the movie, that was fantastic. There are no words to describe the level of privilege to be in the same movie with him, to be on the same set as him, and to be the recipient of the generosity this man has, as an actor and as a person. That's my time, Édgar. Thanks so much. It was a pleasure. Édgar Ramírez: Thank you very much. It was a pleasure talking to you. You can watch Édgar Ramírez play The Liberator, in theaters October 3.